Whenever men and women live under the same roof, this debate is pervasive beyond all others. And yet the womenfolk out there would have us believe that it is not in fact a debate. That instead it is our sacred duty, our moral imperative, to put down the toilet seat after use. But have they ever really thought about it? Let’s try and break this down. The obvious: to not have to expend that egregious effort to constantly lower the toilet seat before using it. The less obvious: for the man to nonetheless always raise the seat before he himself uses it, so as to avoid the possibility of spray on the Queen’s Throne. 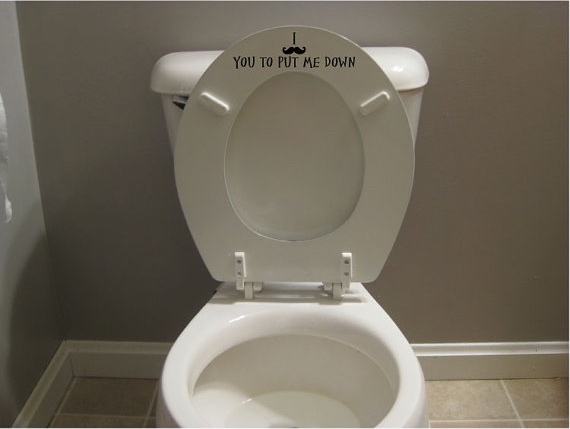 Men should leave the toilet seat up. Women should leave it down. Before the man uses it, he will then have to raise it. Before the woman uses it, she will have to lower it. Assuming an equal amount of effort for raising and lowering the seat, this means that each party is expending an equal amount of effort for each usage. Additionally, if the seat is left up, then the woman will be secure in her knowledge that there was never any chance for a stray spray for her to dismay. DISCLAIMER: My panel of experts may or may not consist of a multi-paneled mirror. But they are to be trusted.